The Tourist Office in Caen offers coupon books that can provide a variety of discounts. The Caen Pass Tourisme is a small booklet that offers reduced admission to some museums in Caen and the area, as well as discounts at some shops and attractions. While you may not be interested in going bowling during your time in France, you might find a 10% reduction at a restaurant attractive. You can get the pass at the Office de Tourisme in Caen. 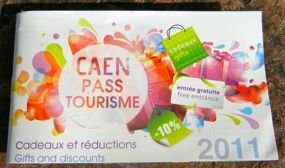 Above, the Caen Pass Tourisme, a small coupon book with discounts.